I was born on March 3, 1945 in Eureka, California, and my maiden name was Linda Louise Larsen. I then lived in Chicago and nearby cities through grade school, and in Summit, New Jersey, and then Elmhurst, Illinois, during junior high and high school. After the University of Wisconsin, Madison, I moved to Berkeley, California, in 1967. I now live in Bodega Bay, which is North of San Francisco. I continued painting while employed at UC Berkeley. I was admitted to Boalt Hall School of Law at UC Berkeley in 1973 for one of the first classes with a high percentage of women, the Class of 1976, and was a San Francisco business litigation attorney for 40+ years. I resumed my personal focus on oil painting in 2008, but this time landscape painting captured my enhusiasm and vision. My husband Dan Rohlfing and I live in Bodega Bay, California, and with him I own Bodega Bay Heritage Gallery, the fine art gallery that specializes in Early California Art 1850-1950. (The art gallery is presently online and by appointment rather than in a "storefront".) I paint principally on the Northern Coast of California, including Sonoma and Marin Counties, and also takes my paints and camera to Hawaii and the Southwest and Northwest. I have studied with Camille Przewodek, and taken workshops with Jeannette LeGrue and J. Thomas Soltesz. My gallerist activities also give me great insight into the numerous deservedly famous California and American artists of the past with whose works and histories I associate on a daily basis. I was born an artist, but at a time when women were not wanted in the New York City fine art world. (My high school years were in Summit, NJ, a NYC suburb.) Although I was a serious artist, and recognized as such in classes and compettions, I also excelled in academic subjects. Art school was not a logical path for me. 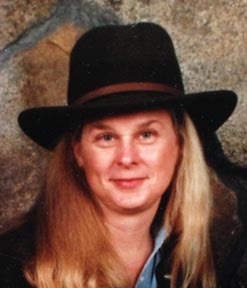 Later, to support myself I headed to law school at Berkeley in 1973 for one of the first classes to admit women in significant numbers; and I have been a San Francisco business litigation attorney for over 40 years, now mostly-retired. For me, it makes a good combination of pursuits. I was an abstract expressionist in Berkeley starting in the 60’s, but now my art is closer to representational, inspired by “living in a painting” in Sonoma County. My approach is personal, expressive. I discovered kindred spirits in the Post-Impressionist “symbolist”/“synthetist” painters (Paul Gauguin, Henry Moret, Odilon Redon, etc.) of Brittany, who emphasized strong colors, emphatic line, and altered and mixed perspectives. There are differences such as my depth of scene instead of flat pattern. Galleries that carry my paintings are the Art Trails Gallery at Corrick’s in Santa Rosa, Bodega Landmark in inland Bodega, and the “Red Shoes” studio gallery at the 6th Street Playhouse in Santa Rosa. I participate in Art Trails, Art At The Source, and the annual Atelier One open studios. 1964, University of Wisconsin, juried. 2010, Bodega Bay Post Office, solo. 2010, Bodega Post Office, solo. 2010, 2011, 2014, 2015, 2017, 2018 Bodega Bay Fishermens Festival, local artists tent. 2011, 2016 Bodega Bay Heritage Gallery, solo. 2009, 2013, Local Color Artist Gallery, solo. 2014, 2015, 2016, 2018 Art at the Source. 2016, 2017, 2018 Sonoma County Art Trails.